A periodic diet that mimics fasting promotes multi-system regeneration, enhanced cognitive performance and health-span, according to last year’s Cell Metabolism publication. There is more. After studies run on yeast, mice and humans at the University of Southern California, it has been proven that a diet which mimicks fasting halves tumors, abolishes cardiovascular disease, diabetes and reduces significantly the risk of Alzheimers. Article: You might like to read our article on the Fasting May Protect the Body from Chemotherapy toxins. “When normal cells are starved, the body uses up stores of glucose and energy to keep them functioning; in response, the cells shift into survival mode, revving up repair mechanism and protective processes to resist anything,” writes Dr Valtor D Longo who shows that a water fast of 4 or more days can trigger a reset of the immune system and promote stress resistance for healthy cells. It does this multi-system regeneration and rejuvenation by activating stem cells. During studies on mice who re-feed after fasting, the stem cells started to proliferate in a coordinated manner to regenerate parts of systems and organs. They believe the same occurs with humans. As we get older, our blood contains too many memory T-cells (helper cells), each programmed to combat a particular microbe, and not enough naive T-cells(Th2 cells), which respond to new challenges. Fasting or Fast-Mimicking purges and rebuilds the immune cell population with naive T-cells (Th1). There is also an enduring effect on insulin sensitivity, which is a primary driver of aging via IGF-1 (Insulin Growth Hormone) and high levels of protein intake combined with a sedentary lifestyle. Many people find it difficult to sustain a zero-calorie fast for 4 days, and so Dr Longo has developed a 5-day diet program that delivers much of the benefit with less hunger. It’s not exactly a free lunch, but at least to some extent you can have your fast and eat it, too. Dr Longo endorses a program under medical supervision for those with Cancer overgrowth using a package of prepared vegan foods, including herbs and caffeine. His company is developing products such as soups, stews and chew bars as a packaged 5-day diet, however, if you click the tab above marked ‘Recipes’ you can make your own calorie controlled FMD program and using the programs below. As a result of the above research, we have compiled three plans you can choose from, but with some important differences. We have included herbs and supplements which fall within the low-calorie, low protein footprint and which support the liver, DNA, bone, gut and blood. These are as adjuvents to chemotherapy in our CHEM-FHD plan, or as standalone nutraceuticals in our HERBILON-PF (Intensive) plan, which is a non-toxic way to combine prolonged fasting (PF) with powerful healing herbs and low-calorie nutrition. By replacing an individual’s normal diet periodically (once every month or once every 3 months) for four to five days, the Fast-Mimicking diet plans may have effects that can last for months and could be a game changer with Cancer patients. However, whilst there are trials still underway to prove other variations, but as it stands this is very compelling proof-of-concept evidence so far. So if it resonates with you, please use these resources and the herbal formulas and recipes. (at your own risk of course) you are after all the master of your own destiny. is our Fast-Mimicking plan using either a ultra-low-calorie fast or for 4 days or the 4-day Fast-Mimicking Diet (FMD) depending on your preference. The diets are using strong herbs which target cancer cells whilst further protecting the organs, bone, blood and immune system using herbal teas, broths, ghee, grass fed butter, coconut oil and green powdered drinks. The plans are preceded with a detoxification gut-healing run-up for 2 weeks and then detoxification herbs and baths afterwards. The more cycles you can do of this, say once per month the better. This has been shown in a study on mice that by the 4th or 5th cycle, the immune cells are really revving up and the blood chemistry is improving markedly. Unlike chemotherapy, the active herbal ingredients are gentle and bio supportive to all cells of the body. Herbilon broth consisting of bone-broth, Essential Electrolytes along with herbal teas and Curcumin with Boswellia which are consumed 3-4 times a day interspersed with Hemo Tea and specific herbal combinations of such as Astragalus, Niacin B3 and B complex Vitamins. Niacin has also been found to help Radiotherapy inflict damage on tumour cells whilst offering some degree of protection to healthy cells. This study with mice was using IV administration 30 mins before but oral Niacin dosage for similar effect is not known (some people have been known to take 2 to 3g at a time, tho building up to this is suggested due to possible flushing effects) tho the peak oral concentration is between 20 to 45 minutes of injestion. Niacin B3 should be combined with Vitamin C.
In accordance with studies which have linked longevity and low disease states to low-protein/high fat/high complex-carbohydrate diet, the recipes on the ‘FMD Recipes Tab’ are satisfying vegan meals with the similar calorie content and macronutrients as the ProLon diet. Each recipe has about 360 calories, in the form of 9% protein, 44% fat and 47% complex carbohydrate, allowing you to easily combine two meals to reach the max limit of 725 calories on days 2 to 5 of all the the diets. Notes on Chemotherapy type-specific foods to modify and dietary advice for surgery. The Fast-Mimicking Diet is inspired by the work of Dr V Longo, but not in any way affiliated. Items in Bold are the minimum Chemo FHD plan items are bundled and 20% discounted as [Chemo-FHD – Minimum]. While chemotherapy might save lives, it causes significant collateral damage to the immune system. Chemotherapy drugs cause immuno-suppression by inducing DNA damage and cell death in both peripheral blood (PB) and bone marrow (BM), which often results in the long-term impairment of hematopoiesis (formation of blood cellular components). These meals may be used with the CHEMO-FMD or with the HERBILON PF and HERBILON LT diets, however you could fast more aggressively using water, teas, soups and smoothies. Each recipe has about 360 calories, in the form of 9% protein, 44% fat and 47% complex carbohydrate, allowing you to easily combine two meals to reach the max limit of 725 calories on days 2 to 5 of all the FMD plans. You could also substitute a meal with a home-made broccoli or cauliflower soup or a smoothie. Click here for the Bone Broth Recipe and source of organic bones and kombu seaweed. 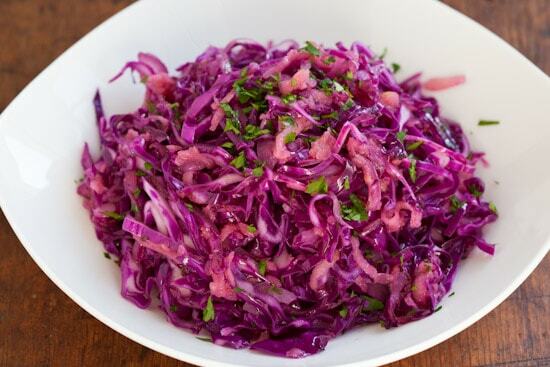 Toss salad with oil and vinegar, adding herbs, spices, garlic, etc. to taste. Shred cabbage, carrots, and apple in food processor. Blend avocado with lemon or lime and pepper. Garlic optional. Toss all together. Braise vegetables in water or vegetable broth. Cook noodles to directions on package. Mix vegetables and noodles and toss with the following dressing: sesame oil, tahini, soy sauce, grated ginger, lime juice. Blend all ingredients in blender, adding garlic and pepper to taste. Hint: leaving some ingredients to the end with just a quick buzz of the blender can add a chunky texture. Blend ginger, garlic, Turmeric powder (extra cayenne pepper, if desired) with a small amount of water in blender. Add oil to heavy pot and heat. Add the spice mixture, being careful not to splatter the oil. Add cauliflower and potatoes and cover, adding more water as needed to prevent burning. Salt to taste. Simmer covered about 20 minutes, until vegetables are cooked. Squeeze on a bit of lemon or lime and add fresh cilantro. Make a pesto with basil, kale, pine nuts, garlic, olive oil, pepper by blending in food processor. Oven cook the squash (or other vegetable), and dress with pesto. Boil dried chick peas in pressure cooker 1 hr, or without pressure 4 hrs, or use canned. 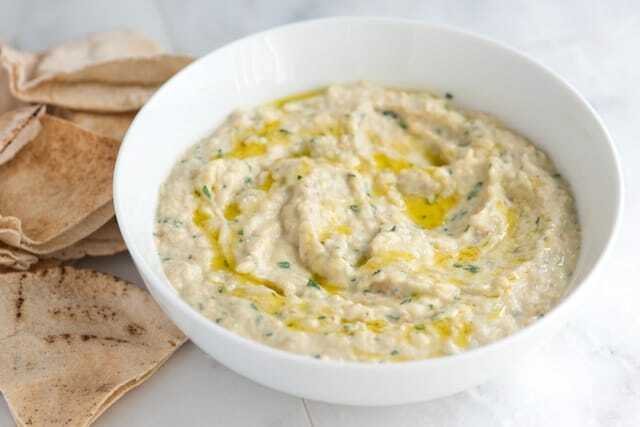 Drain and blend chick peas with tahini, pre-steam spinach, lemon juice, garlic, cumin in food processor. Eat with carrots, cucumber and avocado. Toss spinach, strawberries and nuts with olive oil/lemon dressing, and pepper to taste. Serve with rice cakes. Make pesto in food processor using basil, olive oil, garlic, pine nuts, salt, and pepper. Steam summer squash and carrots; Toss with pesto and serve. Cook green beans or other green vegetable, such as broccoli. Toss with spinach, tomatoes, onion, cucumber, avocado, and dressing of olive oil, vinegar, salt, pepper, and any fresh herbs. Serve with rice cakes. Sauté peppers and onions in oil (can also add fresh garlic), then add carrots and squash with coconut milk, curry powder, and grated ginger. Simmer until veggies and about half cooked (about seven minutes) and then add broccoli and tofu. Cook until desired crispness. Sauté onions, grated ginger, (coriander and garlic, if desired), and chopped almonds in oil. Add chopped carrots and water or vegetable broth, seasoning with salt. Cook about 20 minutes and then puree in blender. Return to pot and swirl in coconut milk and heat till warm. * A note about creamed coconut milk. There are many products labeled “coconut milk,” some of which are closer to coconut cream: very high in fat and calories. The product used in this is Biona Creamed Cocont. Sauté ginger and garlic in oil. Add spinach and cook until wilted. Add a bit of water, if necessary and cover and cook on low heat until totally cooked. Boil potatoes separately. When spinach is cooked, puree in food processor or with immersion blender. Add potatoes and garam masala (a toasted curry power). Serve with fresh tomato and avocado. Sauté onion in oil and add rice, browning gently. Add kale and then add vegetable stock gradually, stirring constantly until absorbed – about 20 minutes. Add salt and pepper and some grated lemon peel. Serve with sliced avocado. A small amount of lemon juice or vinegar can be added for tangy flavor. Toss eggplant and potato chunks in a blend of turmeric, coriander, salt, and cayenne pepper. Heat oil in a heavy pot and add a small about (about ¼ teaspoon) fenugreek seeds. When they turn brown (about 10 seconds) add the coated vegetables and brown uncovered about 5 minutes. Then add enough water so veggies don’t stick, cover pot, and cook about 15-20 minutes. Gently stir in tofu chunks. Heat oil and add 1 t mustard seeds, covering pan. When seeds stop popping, add hot pepper, almonds and cabbage. Toss together and turn off heat. Place in bowl and add coconut, salt, and lemon juice to taste. Serve with rice cakes. Heat oil in pot and lightly saute onion. Add turnips and potatoes, cut in chunks, and almonds. Add water or broth and cover. Cook about 15 minutes. Puree with imersion blender, or transfer to blender to puree. Return to pot and add almond milk, heating soup but not bringing to a boil. Cook the oats with 1C of water. Add nuts, fruit and coconut milk. A small (about 4 oz) apple may substitute for berries. * A note about coconut milk. There are many products labeled “coconut milk,” some of which are closer to coconut cream: very high in fat and calories. The product used in this (and other) recipes is the Trader Joe’s brand of unsweetened coconut beverage—sold by the quart—which contains 60 calories per cup. Cut eggplant in chunks and sprinkle with salt, letting it sit about 10 minutes. Heat oil in pot and lightly saute onion and garlic. Add peppers, squash and eggplant, cut in chunks. Saute about 5 minutes. Add tomatoes and cover. Cook about 15 minutes, until vegetables are tender. Add salt, pepper, and fresh or dried basil to taste. Serve with walnuts. Sauté onions in hot oil, and add curry powder. Add coconut milk gradually, stirring. Add squash and cook, covered, about 7 minutes. Add broccoli and cook an additional 5 minutes, or until vegetables are desired tenderness. Add salt to taste and serve garnished with cashews. * A note about coconut milk. There are many products labeled “coconut milk,” some of which are closer to coconut cream: very high in fat and calories. The product used in this (and other) recipes is the Trader Joe’s brand of unsweetened coconut beverage – sold by the quart – which contains 60 calories per cup. Sauté onion and garlic, if desired in hot oil. Add water or broth and potatoes, cooking about 5-7 minutes. Add kale and continue cooking, mixing as kale wilts add spinach and cook until wilted. Add corn and cook another minute or two. Gently stir in rich coconut milk and heat until warm, but not boiling. Add salt to taste. Heat oil and saute garlic and onion 2-3 minutes. Add peppers and eggplant and continue to saute until wilted. Add tomatoes and cook, covered, about 20 minutes until eggplant is very soft. Add more liquid if needed. Add tamarind, coconut, salt and cayenne papper and cook an additional 5 minutes to blend flavors. Serve with peanuts sprinkled on top. Place chopped kale in a large bowl and sprinkle with salt and lemon or lime juice. “Massage” the kale, squeezing it with your hands until it wilts. It will considerably diminish in volume. Add all remaining ingredients and mix. If desired, fresh garlic can be added. Heat water and dissolve miso in it. Add turnips, bok choy, and mushrooms, simmering, covered, about 5 minutes. Add wakame and scallions for the last minute. Cook noodles separately, according to package instructions, and drain. Assemble soup in a large bowl: add drained noodles and toss with sesame oil. Then add the broth with veggies, seasoning to taste with soy sauce, grated fresh ginger &/or hot sauce. Serve with sliced avocado. Heat oil in a heavy pot and saute onions about 2-3 minutes. Add mushrooms and continue cooking 4-5 minutes, adding some broth if pan is sticking. Add barley, squash, and broth and cook, covered until barley is tender. Check and add more liquid as needed. Depending on the type of barley, cook time may be anywhere from 45 minutes to 1.5 hours. The recipe can also be prepared in a slow cooker on low – requiring 3-5 hours, depending on whether pearled or hulled barley is used. When finished, add salt and pepper to taste. Fresh or dried rosemary is a nice addition and lemon juice can be squeezed on for a more tangy flavor. Serve with walnuts. Bi-monthly FMD cycles started at middle age extended longevity, lowered visceral fat, reduced cancer incidence and skin lesions, rejuvenated the immune system, and retarded bone mineral density loss. In old mice, FMD cycles promoted hippocampal neurogenesis, lowered IGF-1 levels and PKA activity, elevated NeuroD1, and improved cognitive performance. In a pilot clinical trial, three FMD cycles decreased risk factors/biomarkers for aging, diabetes, cardiovascular disease, and cancer without major adverse effects, providing support for the use of FMDs to promote healthspan. During each cycle of fasting, this depletion of white blood cells induces changes that trigger stem cell-based regeneration of new immune system cells. 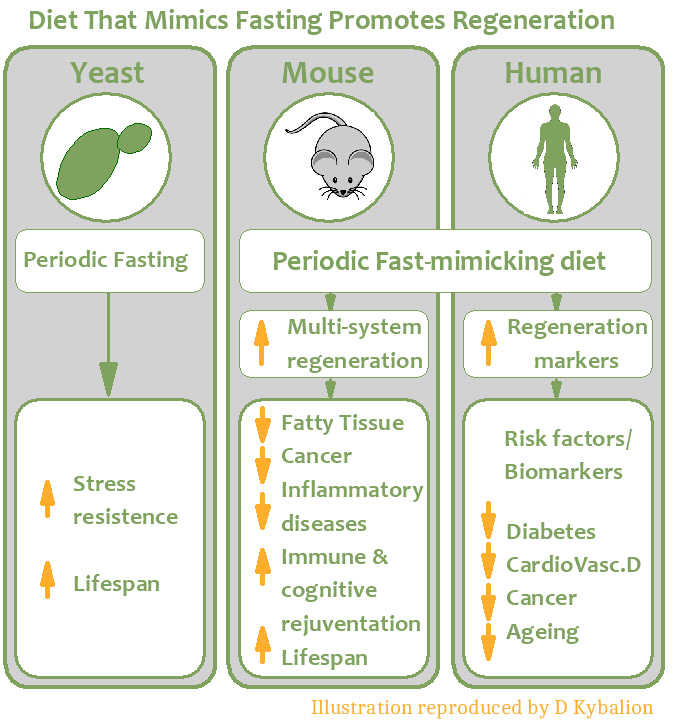 In particular, prolonged fasting reduced the enzyme Protein Kinase-A (PKA), an effect previously discovered by the Longo team to extend longevity in simple organisms and which has been linked in other research to the regulation of stem cell self-renewal and pluripotency, that is, the potential for one cell to develop into many different cell types. Prolonged fasting also lowered levels of IGF-1, a growth-factor hormone that Dr Longo and others have linked to aging, tumor progression and cancer risk. In the control group, white Blood Cell (WBC) suppression, especially the number of lymphocytes, persisted for more than 70 days (six cycles). Prolonged fasting (PF) reduced WBC counts independently of chemotherapy and did not prevent the CP-induced decrease in the number of WBCs. However, the beneficial effect of PF was evident starting on cycle 4 (day 39) followed by the return of lymphocytes to normal levels after the fifth cycle (day 56) . At the end of six cycles of treatment, mice in the PF group also showed normal or close to normal levels of lymphoid cells and normal ratios of lymphoid and myeloid cells (L/M) (Figure 1E, right panel). This recovery was observed at similar time points in three independent experiments (n = 20). They also previously showed that PF reduces circulating IGF-1 levels and that IGF-I deficiency is sufficient to protect mice against chemotherapy toxicity. The studies of growth-deficient yeast and mice could not have predicted the remarkable effect of PF cycles in promoting stem cell-based regeneration of the hematopoietic system. Calorie intake was previously shown to affect the balance of stem cell self-renewal and differentiation, which is important for somatic maintenance and long-term survival. In mice, chronic calorie restriction (CR) promotes the self-renewal of intestinal stem cells, muscle stem cell engraftment and neural regeneration, preserves the long-term regenerative capacity of HSCs (hematopoietic stem cells – blood creating), and prevents the decline of HSC number during aging in certain mice. However, neither CR nor other dietary intervention had previously been shown to promote a coordinated effect leading to the regeneration and/or rejuvenation of a major portion of a system or organ. Because during Prolonged Fasting (PF) mammalian organisms minimize energy expenditure in part by rapidly reducing the size of a wide range of tissues, organs, and cellular populations including blood cells, the reversal of this effect during refeeding represents one of the most potent strategies to regenerate the hematopoietic and possibly other systems and organs in a coordinated manner. Here, they show that Prolonged Fasting causes a major reduction in WBC number, followed, during refeeding, by a coordinated process able to regenerate this immune system deficiency by changes beginning during the fasting period, which include a major increase in LT-HSC and ST-HSC and redirection of the frequency of Ly-HSC/Bala-HSC/My-HSC leading to a lineage-balanced mode. In fact, they show that PF alone causes a 28% decrease WBC number, which is fully reversed after refeeding . Even after WBCs are severely suppressed or damaged as a consequence of chemotherapy or aging, cycles of PF are able to restore the normal WBC number and lineage balance, suggesting that the organism may be able to exploit its ability to regenerate the hematopoietic system after periods of starvation, independently of the cause of the deficiency. Their results indicate that cycles of an extreme dietary intervention represent a powerful mean to modulate key regulators of cellular protection and tissue regeneration but also provide a potential therapy to reverse or alleviate the immunosuppression or immunosenescence caused by chemotherapy treatment and aging, respectively, and possibly by a variety of diseases affecting the hematopoietic and immune systems and other systems and organs.